The Buck Stove 24" Mountaineer Series Vent-Free Propane Gas Log Set is provided with dependable construction in addition to providing the confidence you'll have knowing that the product is proudly produced within the U.S.A. Enjoy simple, easy management of your hearth temperature with the thermostatic valve that is included for your precise control. A dual row burner assembly with integral andirons is supplied as well. This product can be used with the Buck MA19HS heat reflective blower. 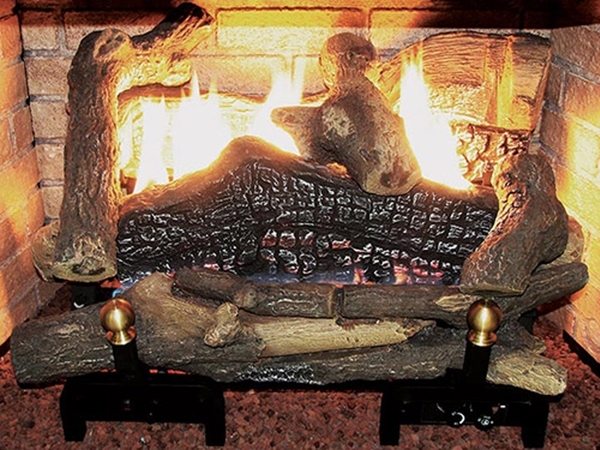 Please Note: The fireplace's Middle Width must be at least 27 Inches and the Depth must be at least 14 Inches for this gas log set to fit. You can calculate the middle width of your firebox by measuring the width (left to right) approximately half way back in the firebox. If you have any questions, please contact our customer service department and we will be happy to assist you in finding the perfect size gas log set.